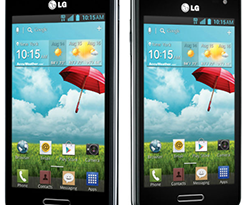 The LG Optimus F3 can be a really cheap bargain if you buy it with a contract from Metro PCS, going as down as $30, but in spite of that you should never underestimate its capacities. Although its design is simple and ordinary, its compact shape makes it easy to hold and its overall appearance is quite appealing, similar to the LG flagship devices. Its main camera has 5 megapixels and what is cool about the Optimus F3 is the microSD slot and a resistant 2650 mAh battery.